If you’re looking for something original, fun and creative to do with your children this weekend, look no further! Down Arts Centre is delighted to introduce a new, innovative puppet theatre company, all the way from Monaghan, to Downpatrick. Creature Works will perform their super-charged theatrical adventure for children aged 5+ and their families, The Time Machine on Saturday 8 February at 1.30pm and 3.30pm. The Time Machine is a gripping tale, jam-packed full of comedy, general mayhem and flatulent monsters! Follow our intrepid hero as he bravely ventures centuries into the future, then watch the adventure unfold as the Professor and his young side kicks, Charlie and Rosie, try desperately to get back to the present. Creature Works’ production of The Time Machine takes young adventurers on a hi-tech roller coaster ride through the fourth dimension with ‘muppet’ style puppets, CGI animated projections, special effects, cinematic sound and much, much more. Creature Works was created in a little farmhouse, deep in the wilds of the Monaghan drumlins, in late 2011 by Designer and Illustrator Tim Evans. What was meant to be a nice little hobby soon became a behemoth of ambitious business plans, character sketching and the constant scribbling of project ideas and outlines. Tim realised very quickly that if he wanted his big ideas to come to fruition he’d need help, and lots of it, and so began getting a team together. By summer 2012 Creature Works had acquired a very talented young team of performers and artists, each with their own unique skill-sets. 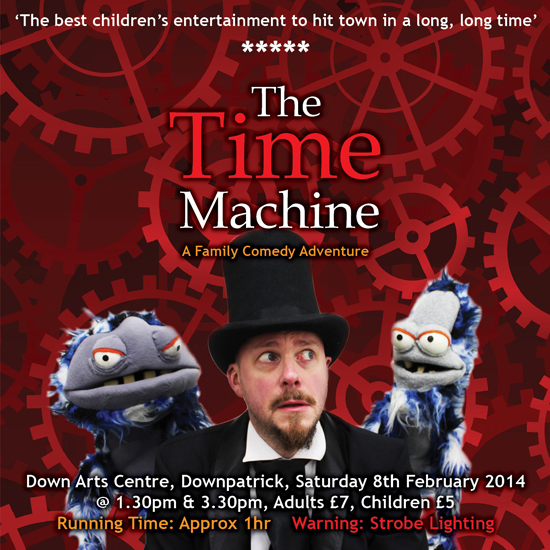 In early 2013 work on The Time Machine began, and it premiered in Castleblayney in June that year to 600 family and friends. The latter part of 2013 saw Creature Works perform at a variety of summer festivals including Carlingford Oyster Festival and Arva 3 Provinces Festival. Creature Works strives to produce the best in live children’s entertainment, using puppets, animation, special effects, cinematic sound and of course fantastically funny and gripping storylines to create really innovative, ground-breaking puppet shows. The Time Machine is suitable for age 5+ and contains some loud noises, flashing imagery and strobe lighting.